Matt Chinian Painting Blog: Maxwell Rd. So where's the green? It's been a week since I last painted, so like confession, I have a lot of sin to confess. For one I forgot how to paint, or what and why. 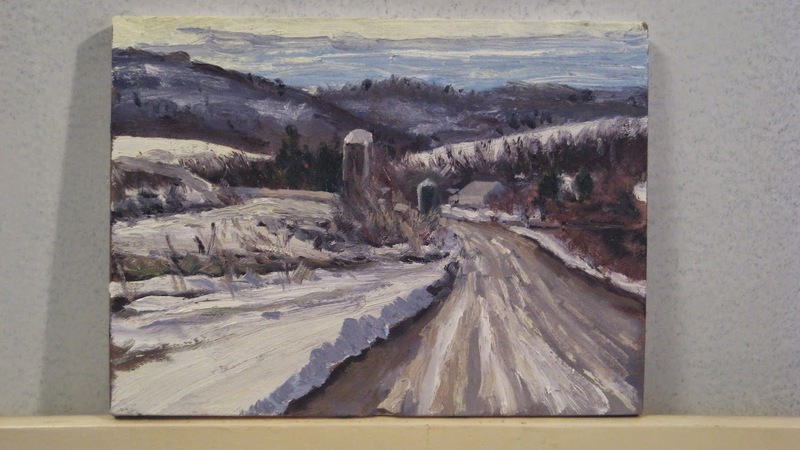 The far hills are too dark, but overall the scene was a bit washed out and the sun was on my panel, which wasn't a problem, especially a bit later. I quickly entered the wilderness and was lost in the haze of grays. I scaped the far hills back twice and when I re painted I mixed the color on the canvas did this work? I wasn't sure what the painting was about. When I started out I was looking for green, even though I passed up better examples of it, so I decided the painting was about digging into the deep part of the green, even though there was still much washed out fuzz. There is too much real estate for an 8 x 10. Here is where I ended up, it was about 1 1/2 hour of painting time, a few drops of rain started but I was finishing up anyway. A selfie, down to two layers! This is the second time from this spot, the other was over a year ago. I was expecting clouds the sun at the start was welcome. This is my family on Easter Sunday. Alane, Emma, Hope and me. This was from March of 2013, after a late snowfall, last year was milder than this one by a mile. Great painting, beautiful family and a Happy late Easter wish. A cloudy landscape but an exciting spot! And a great family. I hope you had a nice Easter and I wish I could meet you all 4 in person one day. I also have been away a couple of days. No painting or drawing at all, some photographs (I still have to think about what to do with them). But most of all looking for inspiration in my head... Sometimes, breaks are necessary so that creativity can recover.